Life is always challenging for a child living with a chronic medical condition. It is particularly hard in places where healthcare resources are scarce. Joel, a young boy living on the island of Roatán in Honduras, was diagnosed at age two with a condition that caused his body to destroy its red blood cells, resulting in severe anemia and iron overload in his organs. Without ongoing treatment, Joel’s life was at risk. He required many medical interventions including blood transfusions every 15 days until his spleen was removed at age 5. Despite those interventions, Joel continued to experience critical symptoms. Few resources existed on the island of Roatán and the mainland of Honduras to treat his condition. Once his spleen was removed, he no longer required blood transfusions, but his organs were still affected by the iron overload. His family had few options to help him. Joel and his family with Dr. Scher & Kristiana Lehn. Joel was diagnosed at age 2, with a condition that caused his body to destroy its red blood cells. Global Healing and partners worked together to help provide the best treatment customized for his condition. Dr. Ligia Fu, Pediatric Hematologist at Hospital Escuela in Tegucigalpa, has followed Joel’s case throughout his young life. Dr. Fu contacted Dr. Eric Scher, who has been involved with Global Healing’s Roatán Volunteer Pediatric Clinic since its opening in 2003. A Pediatric Hospitalist at the Sutter Novato Community Hospital in northern California, Dr. Scher agreed with Dr. Fu that reducing Joel’s iron overload was the top treatment priority. To remove the excess iron, Joel needed a chelating agent medication, a chemical which binds to the iron and allows it to be excreted. In oral form the treatment is very expensive but a less expensive form, deferoxamine, can be given by injections or subcutaneously via a pump and catheter. Although Dr. Fu was one of the main specialists for blood disorders in Honduras, she’d never used deferoxamine in this way. 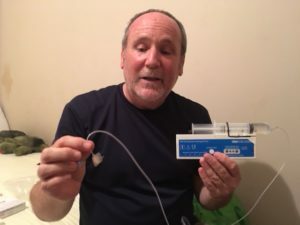 Dr. Scher secured a three-month supply of oral medications, which would normally cost thousands of dollars, along with pumps that could be used to administer Joel’s drugs subcutaneously later on. These all were donated by Children’s Hospital Oakland through time-intensive special efforts by Dr. Ashutosh Lal, Pediatric Hematologist, and Shanon Giane, family nurse practitioner. Because proper administration of the medicine was essential, they also developed the training needed to teach Joel and his mother how to mix the medication in a sterile manner, place the catheter, and safely infuse the medication over a 10-hour period. 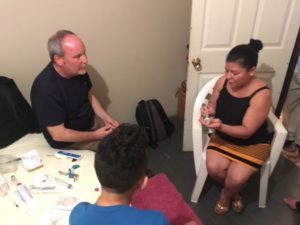 Dr. Scher and Barbara-Jean Stowe, a registered nurse volunteer with Global Healing, traveled from San Francisco to Roatán to meet with Joel’s entire family for comprehensive counseling and training. The training protocol the team developed not only helps Joel and his family but can be replicated by the local doctors for other patients. Dr. Hernán Sabio, a Pediatric Hematologist-Oncologist in Winston-Salem, North Carolina, and Professor of Pediatrics at the School of Medicine at Wake Forest University, stepped in to determine the extent of chelation therapy Joel needed. Dr. Sabio knew the challenges of treating Honduran patients like Joel from having worked with Global Healing in the past. 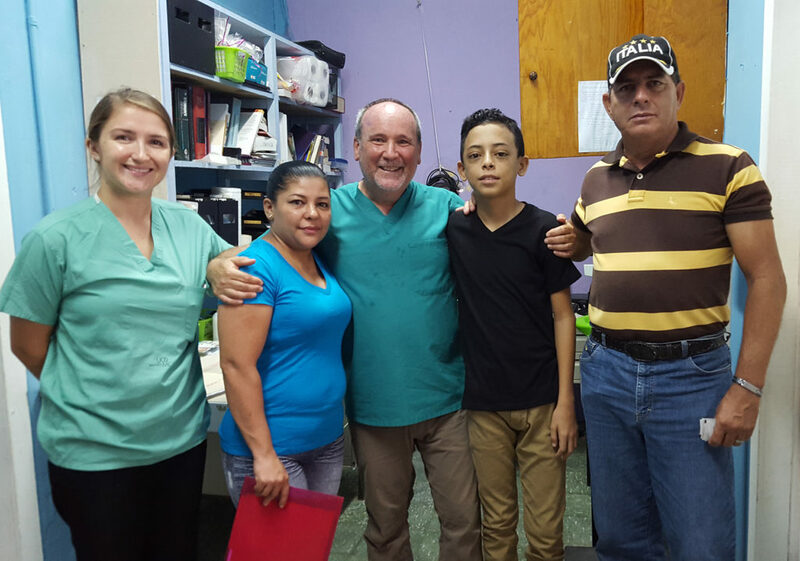 He visited the mainland of Honduras and, with the assistance of medical student and Global Healing volunteer Kristiana Lehn, arranged for Joel and his mother to visit him in San Pedro Sula. There, Dr. Sabio examined Joel and drew blood for a test not available in Honduras which would let the team know how much chelation therapy was needed. Dr. Sabio transported the blood back to the U.S. for analysis. He also secured a much-needed vaccine for patients without a spleen which was not available at a reasonable cost in Honduras, and administered the vaccine to Joel during his visit with Dr. Sabio in San Pedro Sula. In addition to needing to know how to treat Joel, his family needed other supports as well. Kristiana Lehn, a medical student at University of California at Davis, spent almost a year in Roatán with support from her school, Global Healing, and the IZUMI Foundation working on projects related to public health. While there, Kristiana worked with Joel’s family and guided them through obtaining social and medical assistance. She helped arrange for Joel’s family to obtain their first passports and start the visa process for a potential visit to the U.S. for further medical care if needed. So far, because of the outstanding collaborative care provided for Joel in his homeland, he has not needed to travel to the U.S. for treatment. Joel is now getting the best treatment available for his situation, one that is customized for his condition, his location, and his family’s needs. Dr. Scher continues to work with Dr. Fu in Tegucigalpa to train her and her staff for future cases requiring chelation therapy.